I’m usually dazzled whenever I read something by Sarah Rees Brennan, she is a very funny lady and it really shines through her writing. 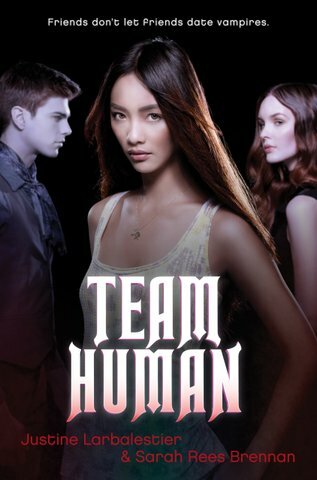 When I found out about her vampire parody novel Team Human I was instantly smitten. It took me a while to get my hands on this book but once it was in my possession I quickly devoured it. Unfortunately, by the end of the novel I wasn’t dazzled. I just felt like I had finished a book. It wasn’t bad, but it wasn’t amazing either. I was not overwhelmed or underwhelmed I was just whelmed. Team Human begins when Francis, a vampire, arrives at Mel’s high school. Mel’s best friend Cathy instantly falls in love with him and Mel is horrified, and rightly so! She can’t understand who would fall for a vampire or why, he’s old, can’t go out in the sun, to her the entire idea is just kind of gross. I liked the world Team Human is set in. Vampires live right alongside humans in their own district (the shade district), and most families have a vampire aunt or uncle that visits. It was an easy world to get to know and become immersed in. I think the reason for my whelmed opinion of this novel was Mel. She was an ok heroine. At times I liked her spunky attitude and meddling. Then at other times she came off as annoying. She wouldn’t just let her best friend be happy, and she constantly had to be the center of attention. I understand that she had some very strong anti-vampire sentiments but I just wanted to shake her, tell her to mind her own business, and live her own life. I think she eventually came to a similar realization (although in a much nice fashion) but she had an ‘I know better then you’ mentality for most of the novel. I began to actually enjoy the story when Kit entered the scene. He is a human that was raised by vampires and his entire life he has intended to be made a vampire when he turns 18, so that he can continue living in the shade. It was fun to see his opinions clash with Mel and to see how Mel and Kit change each other throughout the story. Overall, I enjoyed Team Human and I liked the world building. It was a fun and fairly quick read, but my on again off again relationship with the main character left me feeling rather ho-hum about the experience.